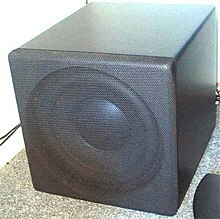 Subwoofer is a type of loudspeaker that is designed to produce low frequencies, example 20 - 200 Hz. Usually subwoofers are quite big and heavy. Humans can not typically hear frequencies below 20 Hz. In some cases, with enough sound pressure, the listener will not hear the sound but will be able to feel it. Wikimedia Commons has media related to subwoofer. This page was last changed on 12 December 2014, at 17:20.